Did Trends Win The Lasy Fred Winter Handicap Hurdle? As tricky a Cheltenham Festival betting heat as you'll get, the Fred Winter Juvenile Handicap Hurdle trends threw up Coko Beach, Prabeni, and Praceps before 2019's renewal. 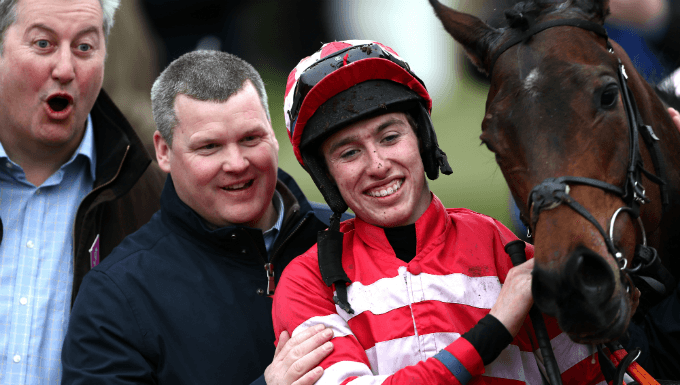 All three ticked all the boxes in the Top 5 trends list above, and filled all of the criteria outlined in the 10-year and 15-year trends too, but Coko Beach had the bonus of being trained by top race trainer Gordon Elliott. He went on to be second, with Praeceps in 6th, and Prabeni disappointing in 14th. Winner Band Of Outlaws carried 3lbs more than any winner in the past 11 years with 11st 8lb on his back, so was readily ruled out on trends, despite winning his last two starts impressively. Third Ciel De Neige and fourth King D'Argent had no recent run, which is a strong trend for winners and placed horses. The Joseph O'Brien-trained Band Of Outlaws landed a substantial gamble to justify 7/2 favouritism in a competitive 21-runner renewal of the Fred Winter Juvenile Handicap Hurdle. A winner over 1m on the Flat, Band Of Outlaws had run three times over hurdles, winning his last two runs at Limerick and Naas. He was given a patient ride by JJ Slevin, overcoming trouble in-running to lead after the last hurdle and gallop away for a two-length win. The Gordon Elliott-trained Coko Beach, who led before the last, did not have the pace of the winner and finished second ahead of the maiden Ciel De Neige, who had not run since August. The Dan Skelton-trained King D'Argent also had not run in 2019, but stayed on well to take fourth, beating Fanfan Du Seuil by a neck.